. . . to all my readers in 2014. Our garden in June (the photo above, as well). I’m also happy to welcome some new visitors thanks to Fine Gardening’s blog, Garden Photo of the Day, which has featured our Kigali garden for December 30 and 31 (and New Year’s Day). This morning in our garden. The sky is overcast; the rainy season has not quite come to an end. We’re down to our last week in Rwanda; next stop: Germany — where it’s been snowing for the last four days. I have done relatively little work in the garden since October, when we returned from our home leave in the U.S. — so finding these bird of paradise or Strelitzia reginae blooms this morning was a nice surprise. I will keep this post quite short because our internet speed has taken a nosedive today (descending to brink-of-tears level), and I just need to get on and off and go decorate the tree. This is my last Garden Bloggers’ Bloom Day report from Rwanda. Next month, we are moving to Stuttgart, Germany. We are very excited about living in Europe for the first time. Please stay tuned. . . . and send me recommendations of German gardens to visit. To see what’s blooming today for other garden bloggers, visit Carol at May Dreams Gardens. Technically, because Kigali is a few degrees south of the equator, it is early summer here. But — given that the temperature is almost always in the 70ºs or low 80ºs — it is more relevant that we are almost three months into the end-of-the-year rainy season. In late October, I came back from five weeks in the U.S. to rampant growth in all the planting beds. Now, I need to wade in and do some serious cutting back all over. To see what’s blooming for other garden bloggers, visit Carol at May Dreams Gardens here. 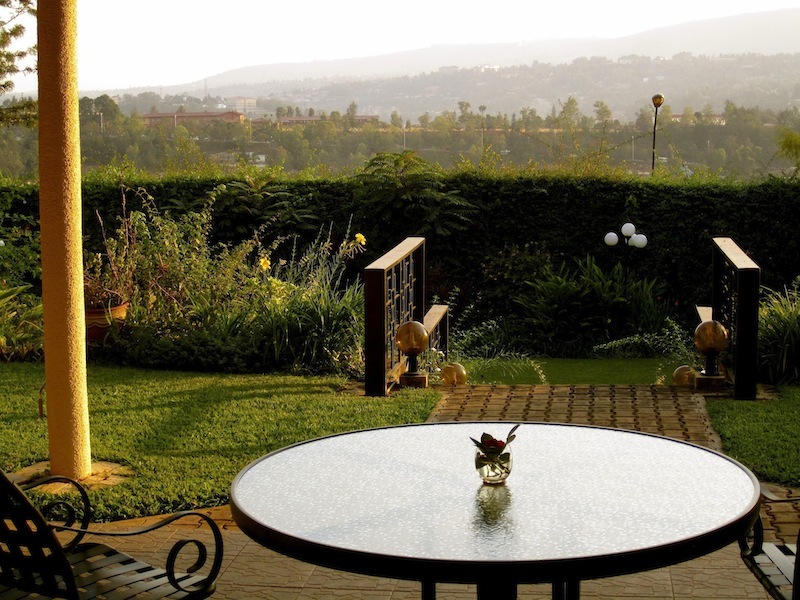 Our garden in Kigali, Rwanda, this morning. 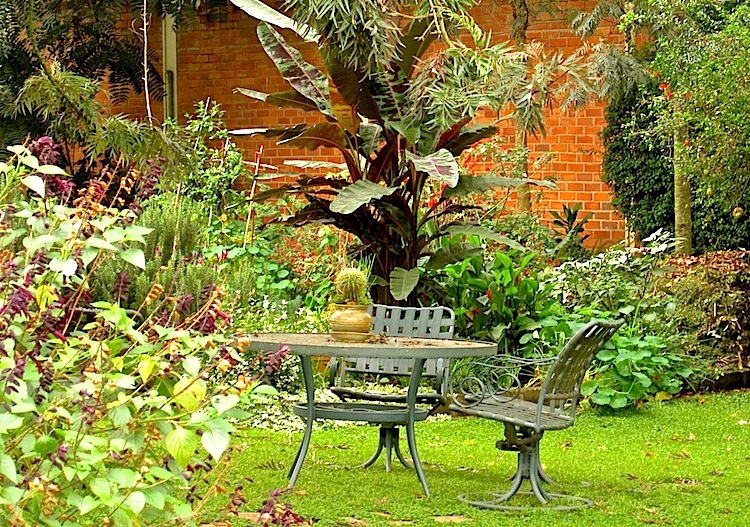 This is an area at the end of our front terrace, composed of mostly tropical foliage plants and shaded by a large red-blooming Mussaenda erythrophylla. Thanks to Pam at Digging for hosting Garden Bloggers’ Foliage Follow Up the 16th of every month. 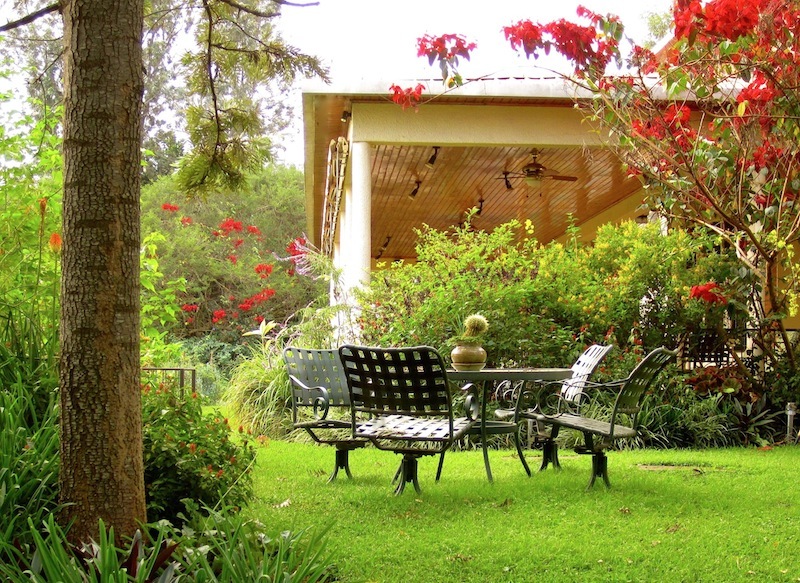 Our garden in Kigali, Rwanda, September 2014. To see what’s blooming in other garden bloggers’ gardens, visit Carol at May Dreams Gardens.